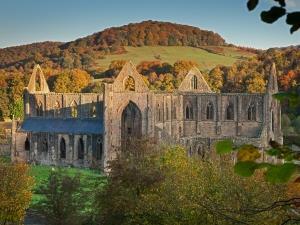 Tintern Abbey (Cadw) Historic SiteThe appeal of this exceptional Cistercian abbey remains as enduring as ever. An area of outstanding beauty complemented by this outstanding beauty in stone. If only the walls could talk! The chants of countless monks echo through the masonry here. Despite the shell of this grand structure being open to the skies, it remains the best-preserved medieval abbey in Wales. Although the abbey church was rebuilt under the patronage of Roger Bigod, lord of nearby Chepstow Castle, in the late 13th century, the monastery retains its original design.